In February, Marvel Editor-in-Chief Axel Alonso set off a storm of speculation when he tweeted out a piece of art depicted what appeared to be a genetic hybrid of the Hulk and Wolverine in a pod labeled "Batch-H."
Now we have some answers. In June 2017, Marvel Comics will launch Weapons of Mutant Destruction, a crossover between Weapon X, one of the new books launching as part of the X-Men's ResurrXion, and The Totally Awesome Hulk. 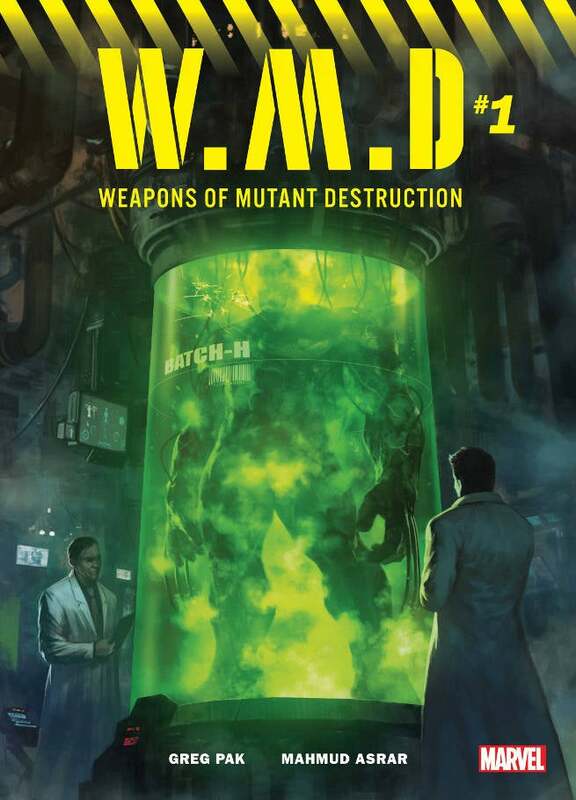 Weapons of Mutant Destruction will be written by Greg Pak, who writes both series for Marvel and is a veteran of both Marvel's Hulk and X-Men lines. The story gets started in The Totally Awesome Hulk #19, a prelude issue guest-starring the cast of Weapon X: Old Man Logan, Sabretooth, Domino, Warpath, and Lady Deathstrike. The crossover begins in earnest in the Weapons of Mutant Destruction Alpha one-shot and continues with chapters alternating between issue of The Totally Awesome Hulk and Weapon X.
ComicBook.com spoke to Pak about what fans should expect from the Weapons of Mutant Destruction crossover. So, in the broadest sense, what is Weapons of Mutant Destruction? Greg Pak: Well, we've got our heroes and villains who are hunting down the new Weapon X and end up teaming up with Amadeus Cho, the Totally Awesome Hulk. That in itself is fun because you've got very different dynamics here where the Hulk is this young cocky dude who thinks he knows everything and the Weapon X team is this hardened group of mercenaries and killers and criminals basically. There are some fun contrasts there but they've teamed up because they found out that Weapon X is hunting the Hulk. The Weapon X Program has a very specific mission in mind and it involves the Hulk, and so now our heroes and the Hulk are teaming up to try to thwart it. Over the course of this story, things are going to get bigger and bigger and bigger and there are a few mysteries that will unspool, and much slashing and smashing. You mentioned how this story has very different personalities coming together, but it is also very different tones in terms of what readers expect fromWeapon X vs. Totally Awesome Hulk. How do they mix together in Weapons of Mutant Destruction? GP: Those two things together provide great story and character fodder. The fact is that the Hulk, Amadeus Cho, is not a killer and he is not a hero who ever plans to kill anybody. That's not in his repertoire of finishing moves. He is an optimist who thinks that he can always find the right solution to any problem and doesn't believe in the lesser of two evils. He thinks he can always find a way to do the right thing and have the right outcome. The team led by Logan is considerably more jaded. Maybe they've seen more. Maybe they just have a different way, a different ethos and attitude towards the world. But that conflict between them as they team up is absolutely going to feed into the story. It's going to be a big part of that emotional journey for these characters going both ways. The tone I think will be darker than your average Totally Awesome Hulk story, as you can imagine, but those contrasts are part of what is going to raise the stakes for all these characters and also just make it a ton of fun in terms of character interaction. How did you conceive of this story? You were already writing Totally Awesome Hulk. Did you have this story in mind when you pitched for Weapon X, or did you start working on Weapon X first and then try to figure a way to bring both books together? GP: It's more the latter. I mean I'd been working on the Hulk. I got the call from Mark Paniccia about working on Weapon X and loved it. Many, many years ago when I was pretty early at Marvel there was a point when I had actually submitted a pitch to work on a Wolverine book. I've always loved that character and I love the Old Man Logan character, and you know, a chance to work on a book starring that character seemed like a huge amount of fun. Then as we developed the Weapon X storyline and kind of realized where this thing was going I think it became apparent that the Hulk could play a very interesting role here. It makes total sense given the motivations of the heroes and villains in these stories, and what the heck? I'm writing both books. My editors came to me and suggested, "Hey, why don't we try this?" It just made a lot of sense to me immediately. What can you tell me about the new Weapon X program and why they're interested in Logan, his team, and the Hulk? GP: I should be very careful here for fear of spoilers. I can say that Weapon X has gone through a number of different incarnations over the years, and so it's a new incarnation of the group, of this nefarious organization, but its mission is to exterminate mutants, which is, of course, a classic mission for many X-Men villains. Weapon X has not always had that as its central focus. At different times that's not been its primary goal but that absolutely is the focus here and now. We are eventually going to learn that a surprising character is in charge of the program, a classic X-Men villain who will be revealed in the fullness of time. What makes it even more interesting is that there is another villain who is involved in all of this with parallel but slightly different motivations. Even as the heroes are figuring out how to work together and what to do there is a very interesting villain story going on during the course of this crossover and I love that. People talk all the time about the idea that a story, a great action story or a great adventure story, often depends on how good its villains are. If you have really great villains then your main characters get tremendous challenges and the story just improves by leaps and bounds, and I'm very excited about these villains in this story. I think we're doing something kind of special. We've been work-shopping and coming together and having big discussions about things, and brainstorming and everything, and I think - I don't want to jinx it, knock on wood - but I think we've hit the sweet spot here. I think we've got something really special going on with these amazing bad guys. I can't reveal too much just yet but you're not going to want to miss it. An organization that’s challenging both Logan and the Hulk must have some significant firepower to do so. Can you say anything about the kinds of threats Weapon X has in its arsenal? GP: Oh yeah! It's Weapon X, right? The whole mission of Weapon X is to create super soldiers or killing machines of some kind or another, and this Weapon X is bigger and badder than ever so they've learned from all of the undertakings that various Weapon X programs have taken in the past and this is the next generation, and it will take everything our heroes have to tackle it. If you know the characters you can imagine that say, for example, Sabertooth and Amadeus Cho might not get along at all, that Amadeus Cho may be exactly the kind of person Sabertooth hates most on the planet. But when you're facing the enemies they're facing it makes sense that they would need each other and have to team up. In recent issues, Amadeus has become part of a group of superhero friends, not exactly a team, that includes Ms. Marvel, Silk, and Shang-Chi. Will they have any role to play in Weapons of Mutant Destruction? GP: Probably not in this story, no, but you're going to see there's a big story under way right now with that team, with those heroes, that goes to issue #18 of Totally Awesome Hulk. It's a four-issue story that started with issue #15 and that's definitely a team that's near and dear to my heart and I expect we'll see them again in the fullness of time. Wolverine and the Hulk have a history in the Marvel Universe, with Wolverine’s first appearance being in an issue of The Incredible Hulk, and they seem to run into each other in this way every so often. You’re dealing with a slightly different Wolverine and a different Hulk, but what do you think it is that’s so fun about pairing those characters that writers keep drawing them together? GP: Part of it is Wolverine, the classic small scrappy predator, fighting the giant predator. It's the Wolverine versus a bear fight, right? They've always been fun just because they are two of the most ill-tempered characters in the Marvel universe, so you put them together and you're likely to get some sparks. There's also a lot of fun just because Wolverine's such an underdog in that team up and yet, with his adamantium claws, he's one of the few people who has some chance of piercing the Hulk's skin on a good day, and his insane healing ability rivals that of the Hulk's. They're probably the two best healers in the Marvel universe, or self-healers anyway. All of those things make it a fun team up. I think the other thing about them is that over the years, these are classic characters, they've been around for decades and they're incredibly popular characters among both readers and writers, and so there have been many different incarnations of them and many different versions, and it's always fun to see different versions of these characters come up against each other. In this case, we've got Old Man Logan who's the old Logan from the future coming up against Amadeus Cho, who's the new Hulk, this cocky kid who took the power of the Hulk from Banner with the idea that Amadeus would become the best Hulk there ever was. This power is not a curse to him. It's just almost like an insanely fun toy. Of course, he's got a lot to learn about what it really means to be the Hulk but that gives us a different dynamic now. That's going to be something fun to explore, how we think we know what a Hulk-Wolverine conflict or team up looks like, but with these two versions of these characters surprising different things can come up, and that's always fun. GP: Yeah, it's pretty interesting isn't it? You know, we'll see what Batch H is all about. It looks pretty amazing, doesn't it? Weapons of Mutant Destruction will serve as the second arc of Weapon X, but speaking of the book more generally, some have wondered why it isn’t simply an X-Force book. The key difference seems to be that this is a team brought together by necessity rather than one with a proactive mission they’re seeking to achieve. Is that fair to say? GP: Definitely, at this early stage anyway. It's not like one of these characters woke up and said, “I think I need to put together a wet works team,” which has been the classic setup for X-Force teams in the past. This is more that extreme circumstances have pulled these different characters together, which creates an interesting dynamic because, beyond this mission, what holds them together, if anything? And will they, during the course of this motion, develop bonds that keep them together beyond this mission? We will see. One of the great things about writing a team book is that you can keep the stakes pretty high in terms of characters and character dynamics because the book doesn't depend on any one of those characters and so high-stakes things can happen. You know, if you're writing a book that just stars one character you can pretty much guess that that one character is going to come through in the end every time. They will absolutely will have topsy-turvy things happening and dramatic happenings, but that character is generally going to stick around and be the star. But in a team book anything could happen so that raises the stakes in fun ways. It can make a dangerous action sequence and a story with high-stakes more real in a way because you don't know who's going to make it out and you also don't know what the dynamic of this team is going to be at the end. It's not a foregone conclusion that this team will stay together in exactly the same way, and big character changes are certainly possible in terms of relationships and how people feel about each other. I think that's one of the glories of the X-Men, frankly. Over the years. smarter people than me have talked about this but there's a lot of similarities between comics and soap operas in that they're serial storytelling and the X-Men, in particular, has been a franchise that has depended on characters, on emotional relationships between characters and the way those relationships change over time. It's fun to be able to dig into that in a big way. Now that you’ve been writing this particular group of characters, have you found yourself surprised by how any particular relationship has popped off the page or by how you’ve gravitated towards writing a certain pairing? GP: Oh, yeah. You know, it's funny because when picked all these characters we used our best judgment in the beginning. We picked them all for good reasons, both plot-wise and character-wise, and the hope is that you can put any two of them in a room and interesting things will happen because you've picked the right mix. It's been fun because so far that's been the case. It's pretty neat being able to kind of walk in and play with these toys. This is always the blessing and the curse of comics, right? Continuity. You've got characters with interesting pasts and interesting backgrounds and that can be very difficult to work with sometimes because sometimes those pasts are so complicated and it can feel restrictive, but the different perspectives that these characters have on life and their different experiences are a huge gift. When you are writing a book like this and you put these two different characters who have two very different experiences together, and if you've done your homework you kind of know about them, you can play with that in subtle ways that just pay off so nicely. I actually was just writing a scene with Amadeus and Lady Deathstrike. They have to team up in one part of one of these books and the contrast there is so great. A thing comes up and, in a subtle way, each one of them is reacting to it differently because they've had just totally different experiences coming up in the world. Those kinds of dynamics are just a blast. I also think we've got a good, fun dynamics just because we got some good straight men and some good jokers, and that's always fun. We've also got the chance to turn those around. Sometimes the person who's the straight man in a particular sequence or joke is not who you expect, and that's a pretty fun twist on the whole thing. Sabretooth and Logan are going to be guest-starring in an issue of The Totally Awesome Hulk before the Weapons of Mutant Destruction crossover officially kicks off. What can you tell me about that story and how it relates to WMD? GP: We're going to start to find out what the interest of Weapon X is in the Hulk. We'll start to find out how the Hulk fits into the story in that issue and see what the members of our team and the Hulk himself have to say about that or how they feel about that, and what happens when they come together. Any last notes you want to leave readers with? GP: Greg Land has been drawing this first arc of Weapon X and he's doing amazing, amazing stuff. He's getting under these characters’ skin and it's just great moment by moment storytelling. Also, like with Wolverine and Sabertooth in particular, and with all of these characters, honestly, I'm really in the scripts trying to introduce them in specific places and see them in the worlds that they live and have a kind of gritty, lived-in experience. We want it to feel real. We want it to feel cinematic. We want it to feel like you can feel the grime under their fingernails and the pain in their joints, and experience the story with them. Greg is just doing a tremendous job with that. The atmosphere he's bringing into it. The opening scene in the first issue takes place in the woods and he's got these establishing shots, these opening shots with fish and some deer, I mean it's subtle stuff but it's just beautiful. He's doing a great job. Mahmud Asrar is going to draw Weapons of Mutant Destruction Alpha – the kickoff book we’re working on that introduces the crossover. Mahmud has been drawing Totally Awesome Hulk and has just been killing it. He loves the character and has brought out all of his charm and his brute force at the same time. It's been a total blast and I can't wait to see Mahmud dig into these Weapon X characters as well. Look for Weapons of Mutant Destruction Alpha on sale in June!